The above comments may appear rather harsh. However, it is true that the visitor to Breadsall Priory wanders from old to new almost as soon as they enter this grand old mansion. Recent additions have confused the layout but there remains, at its core, an almost intact Elizabethan mansion, a 19th-century house and the ruins of a 13th century priory owned by the Austin Canons. Breadsall Priory is a former Augustinian priory in Derbyshire, close to the city of Derby, and situated around two kilometres north of Breadsall, and two kilometres east of Little Eaton. In 1536 all monasteries with revenue less than £200 a year were suppressed by Henry VIII and handed over to the Crown. Breadsall Priory and its land was leased to Laurence Holland of Belper in 1537 and used for agricultural purposes. In 1552 it was handed to Henry, Duke of Suffolk, the father of Lady Jane Grey, but he only retained ownership for a few months. He sold it to Thomas Babington of Dethick and Kingston in 1553. 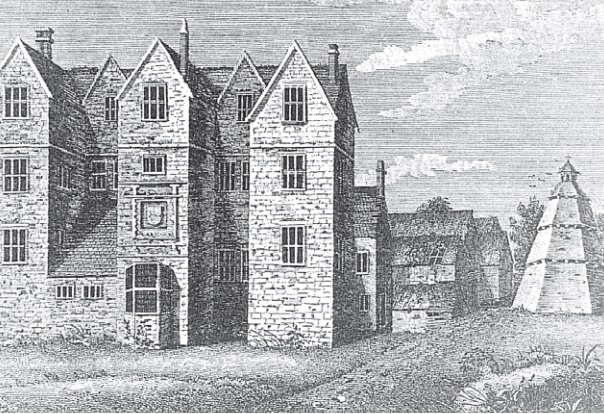 Babington sold Breadsall Priory to Thomas Hutchinson in 1557 and by 1573 it was in the hands of John Leeke, the uncle of Bess of Hardwick. Around 1795 it was bought by Sir John Bentley, a knight and Councillor-at-Law. By this time the Priory had been inhabited and in ruinous state. Bentley converted the priory into a tall e-shaped dwelling and lived there until 1621. Following John Bentley’s death in 1622 the house passed via his heiress to Sir Gervase Cutler and then to Sir Edward Mosley of Ancoats, from whom it descended to a distant cousin, also called Sir Edward Moseley. He granted Breadsall Priory to his son-in-law, Sir John Bland of Kippax in Yorkshire, in 1693. Bland sold the house to Thomas Leacroft of Wirksworth for £1,675 in 1702. The following year Leacroft sold it to Andrew Greensmith of Steeple Grange, a partner in his lead smelting business. Breadsall Priory remained with the Greensmith family until 1799 and underwent a series of alterations including re-siting of the main entrance from the east front to an extension on the north side. The last family occupant was Hannah Greensmith Beard of Lincoln who died in 1797. Her sons sold the house and grounds to Erasmus Darwin in 1799. The first few years of Darwin ownership proved tragic but the name will always be associated with Breadsall Priory. 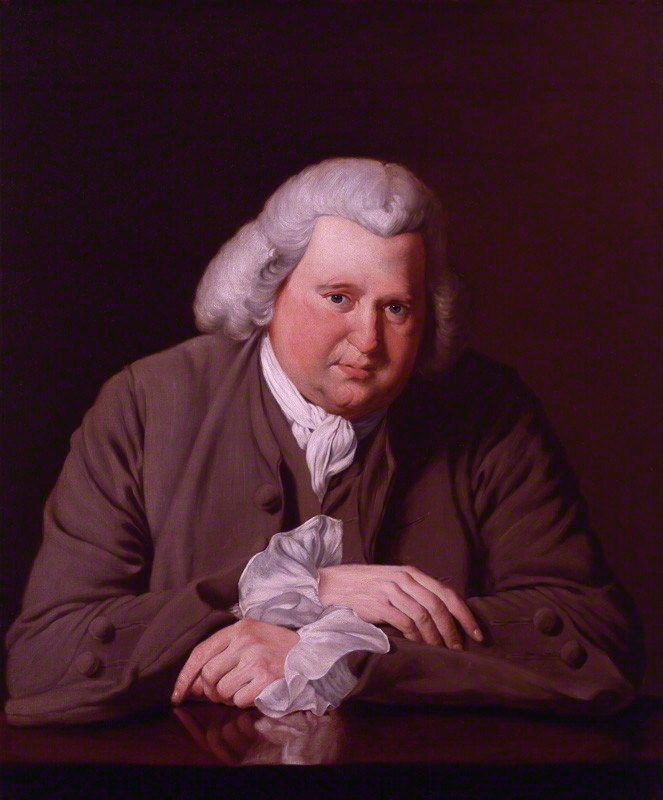 According to Nick Redman, Erasmus Darwin (1759-1799) was 41-years-old and unmarried when he bought the estate. He was the son of Dr Erasmus Darwin (1731-1802) whose scientific and philosophical achievements were well-known across the land. He was a physician, poet, and botanist noted for his republican politics and materialistic theory of evolution. Although today he is perhaps best known as being the grandfather of naturalist Charles Darwin and of biologist Sir Francis Galton. Dr Erasmus Darwin had married Mary, daughter of Charles Howard of Lichfield, who produced three sons – Charles (who died aged 19), Erasmus (II) and Robert (who was father to Charles Darwin). Erasmus, the second son and new owner of Breadsall Priory, had wanted to enter the church but instead became an attorney-at-law specialising in property and opening a practice in Derby. He bought Breadsall Priory in November 1799 but on the night of 29 December ran out of the house in a distressed state and was later found drowned in the River Derwent. The exact circumstances of his anguish remain a mystery but the likelihood is that he committed suicide. Breadsall Priory reverted to his father, Dr Erasmus Darwin, who had been living in Derby since 1783. Darwin probably commissioned an extension on the east front of the house but didn’t move in until March 1802. His stay lasted a matter of weeks and on 18 April Darwin died from a heart attack. His second wife, Elisabeth, widow of Colonel Chandos Pole of Radbourne, remained at Breadsall Priory until her death in 1832. (Darwin had married Elisabeth Pole in 1781 and had three sons and three daughters). Following Elisabeth’s death Breadsall Priory was inherited by their only surviving son, Francis Sacheverel Darwin (1786-1859). Graduating from Emmanuel College, Cambridge he travelled the world aged 22-years-old. Darwin had started with four others, one of whom was his brother-in-law Theodore Galton, on a tour through Spain, the Mediterranean and the Near East. They came in contact with war, robbers, privateers and the plague and only Darwin returned alive. Francis became a physician inheriting his father’s tastes and distinguished abilities. He had lived for a time at Lichfield where he had an extensive practice and subsequently at Sydnope near Matlock. In 1815 he married Jane Harriot Ryle, youngest daughter of John Ryle of Park House, Macclesfield, and had three sons and seven daughters. He was knighted by George IV in 1820 and served as a Justice of the Peace and Deputy Lieutenant of Derbyshire. The last tenant at Breadsall Priory was Joseph Webster whose family developed a wire drawing business in Sutton Coldfield. He had safeguarded the firm against competition from a new patent piano wire by successfully negotiating a merger and creating Webster & Horsfall Ltd of Penns Mill. The company would also produce the wire used in the first transatlantic cable. Webster left Breadsall Priory and moved to Ashfurlong House at Sutton Coldfield. 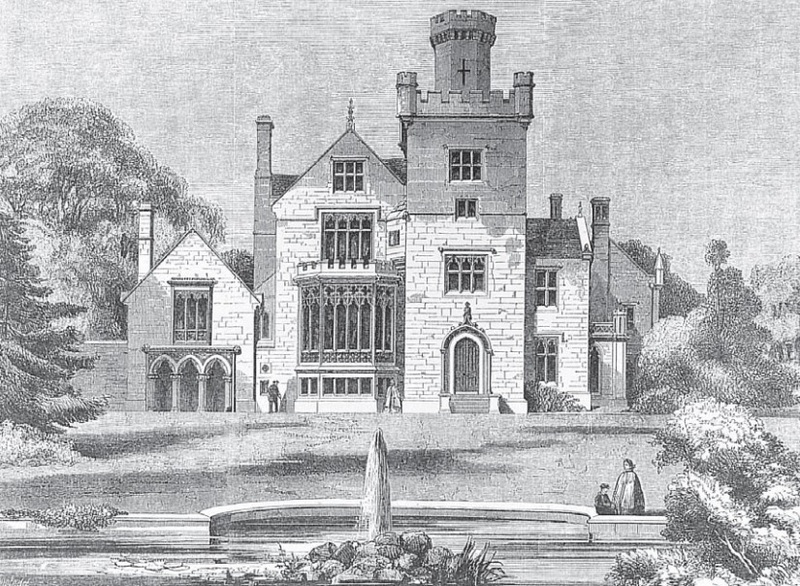 Francis Darwin finally moved into Breadsall Priory in 1847. He was a keen antiquarian and carried out several excavations hoping to find a tunnel that was rumoured to run from the house to Horsley Castle three miles away. He dug a trench along the north side of the house but found nothing. In his later years Francis Darwin lived in retirement and due to age and increasing infirmities was unable to mix in society. He died in 1859 and Lady Darwin moved to Breadsall Lodge nearby. In January 1860 Breadsall Priory and its estate were put up for auction at the Royal Hotel in Derby. Bidding opened at £10,000 and was sold to Mr Francis Morley for £13,000. In March the entire contents of the house were auctioned and Morley took possession on March 25 1860. Francis Morley was the son of Richard Morley of Sneinton Hall near Nottingham. The hosiery firm of I. and R. Morley was established by John (1768-1849) and his brother Richard (1775-1855) in about 1797. Hosiery was still primarily a cottage industry at the time. Entrepreneurs like I. and R. Morley were essentially wholesalers, buying in goods and storing them in warehouses in Nottingham and in the City of London. Francis Morley might have been expected to join the family business and for a time did play an important part. However, marriage took Morley into the world of pottery with considerable success. In 1835 he married 18-year-old Emma Ridgway, daughter of the famous potter William Ridgway. Morley became a partner in Ridgway, Morley, Wear and Co and in 1842 became sole proprietor with Ridgway. When Ridgway retired Morley continued the business alone before going into partnership with Samuel Astbury and trading as Francis Morley & Co.
Business was carried out at the Broad Street Works, Shelton, in Hanley, but Morley recognised the importance of new markets and built a factory in Philadelphia, USA. The company became famous for its ironstone and earthenware and was producer of the acclaimed Mason’s Patent Ironstone China. (Morley had bought many of Charles James Mason’s moulds when the latter went bankrupt in 1848). This product is now highly collectable in modern antique markets. 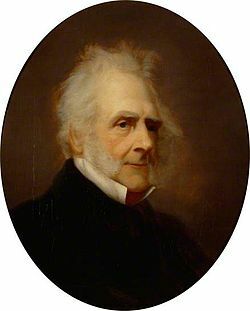 The partnership with Samuel Astbury was dissolved in 1853 and Morley took another partner, Taylor Ashworth, with whom he worked until 1862 before taking retirement. It was with this in mind that Morley bought Breadsall Priory in 1860. Until then the house looked almost as it did in John Bentley’s day. The only change had been east front additions and Morley was keen to bring the house up to Victorian standards. Morley returned to the Potteries and engaged the services of the architect Robert Scrivener (1812-1878). The Ipswich-born son of master builder William Scrivener had moved to Staffordshire in the 1850s, establishing a practice in Shelton, close to Morley’s Broad Street works. Scrivener was one of North Staffordshire’s leading architects designing many of Hanley’s most notable buildings. The style chosen for Breadsall Priory was theatrical and changed the appearance entirely. The Victorian Gothic style was complicated and hid most of the original house behind a new façade. ‘Morley began by removing all the additions on the east side. He then added a large three bay extension which butted up to the front of the old house, leaving only Bentley’s attic floor visible. On the central bay was a projecting porch with a balustrade and battlemented corner turrets. ‘North of the porch he placed a separate castellated extension with a new dining room at ground floor level, and with bedrooms and bathrooms above. 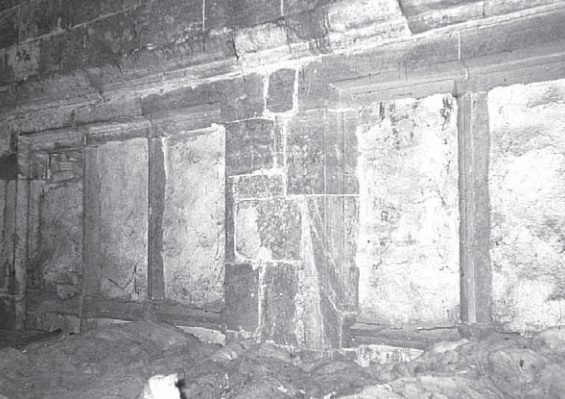 Below it two wine cellars linked to the basement beneath Bentley’s north east tower. ‘Between this extension and the old house Morley inserted another block, also castellated. The Gun Room on the ground floor had a side door. The construction of these new buildings covered or destroyed the Priory foundations revealed earlier by Sir Francis Darwin. ‘The old entrance hall which had been very narrow, was enlarged by taking away a large portion of the lower section of Bentley’s central tower, in which was formerly a winding staircase. The new entrance hall measured 24 square feet, with solid parquet flooring, the centre of oak and walnut interlaced, with an ornamental border of elaborate design. The principal staircase was of carved oak. ‘The gabled stage of the south-east tower was replaced by another floor with battlements and overhanging corner turrets. Above this was a tall octagonal stair tower with cross arrow slits, machicolations and battlements. 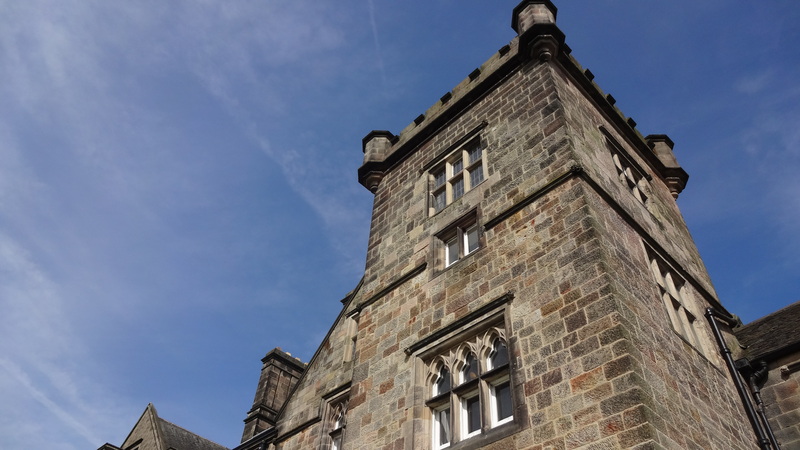 ‘West of this tower Morley replaced the large gabled return with a replica of one of Bentley’s gables, but retaining Bentley’s mullioned window within it. He inserted a new window of four lights and added below it a large canted bay with a trefoil-headed battlemented windows under quatrefoil decorations. The house was completed in autumn 1861 and Morley spent the next few years developing the grounds and parkland at a cost of about £4,000. Despite originally investing in new farm buildings Morley decided to withdraw from agriculture in 1875 selling all his livestock and equipment. 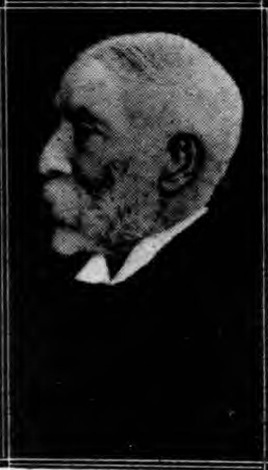 In his later years Francis Morley suffered ill-health. However, his widow had no intention of staying at Breadsall Priory. On June 17 1884 the entire estate was offered for auction at the Mart, Tokenhouse Yard, London. The purchaser of Breadsall Priory was Henry Joseph Wood. He was a native of Kent, being the son of Edward Wood of Aylesford. In 1876 he married Jane Cooper, the only daughter of Joseph Cooper of Trent Vale, Staffordshire, and moved to the midlands. 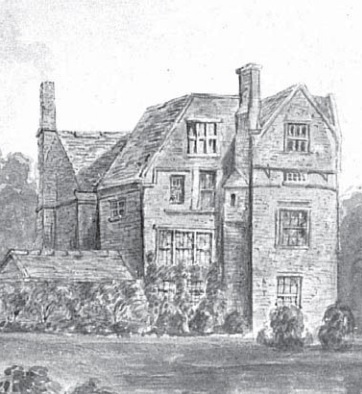 Quite how Wood made his living is uncertain but prior to buying Breadsall Priory he was living with his family at The Hollies, the Cooper’s ancestral home at Trent Vale. In 1885 Wood qualified as a magistrate for Derbyshire and also served on Derbyshire County Council. In 1888 he was elected the President of the Derbyshire General Infirmary. Wood was a man of many interests. In his younger days he had been a keen cricketer, playing for the Derbyshire Friars. He was also fond of hunting, and was well-known with the North Staffordshire, the Meynell and the South Nottinghamshire packs. He was also a keen shooter and kept this up until old age. His stay at Breadsall Priory proved to be relatively short. In March 1892 he auctioned his entire farming stock and made plans to return to his native Kent. Wood moved to Bidborough Court, a huge Victorian house built in the 1860’s near Tunbridge Wells, and previously known as Elm Court. He became a J.P. for Kent as well as serving on Kent County Council. He became a visiting justice for the Kentish Asylums and the County Gaol, and devoted much of his time with the Discharged Prisoners’ Aid Society. 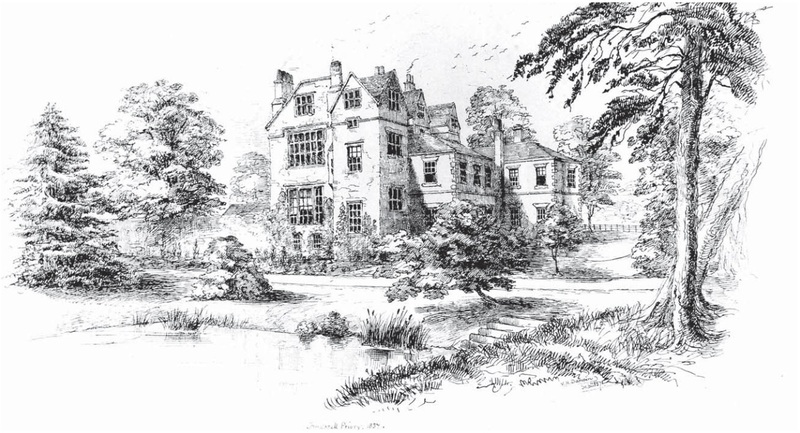 Henry James Wood sold Breadsall Priory to Captain Richard Rainshaw Rothwell. It is likely that he bought the house with the proceeds of an inheritance from his uncle, also called Richard Rainshaw Rothwell. The older Rothwell had been the owner of large estates in the Bolton area of Lancashire who, for his active interest and financial contributions towards Italian unity, had been created the Marquis de Rothwell and later a Marquis of the kingdom of Italy. He lived at Sharples Hall, Bolton-le-Moors and died in 1890 leaving no male heir. The majority of his vast estate passed to his nephew, Richard Rainshaw Rothwell, the son of his brother, Ralph Rothwell. Rothwell, the younger, was born in Dunkirk, France, in 1861. He spent most of his childhood in Kent before attending a Gentleman’s School in Hampstead. He married Mary Constance Murdock in 1881 and settled in Berkshire. By the time he inherited his fortune he was living at Finley House at Andover in Hampshire. He became a J.P. for Lancashire but quite how he came upon Breadsall Priory is open to speculation. Newspapers reported that Rothwell was going to make considerable improvements to the house and he made good his promise. He provided a supply of spring water from two powerful springs and created a 30,000 gallon reservoir. This supplied the house and outbuildings as well as the ornamental lake and fountains. Rothwell also installed electric lighting throughout the house. 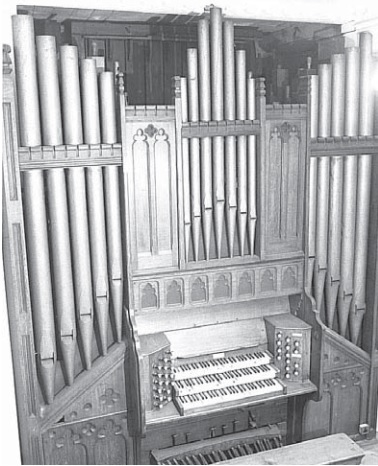 According to Nick Redman he was also thought to have installed a three-manual barrel organ built by Alfred Noble of Birmingham. This stood in the entrance hall and was used until after the First World War. In 1975 it was presented to the Darwin School at Chaddeston but subsequently dismantled. 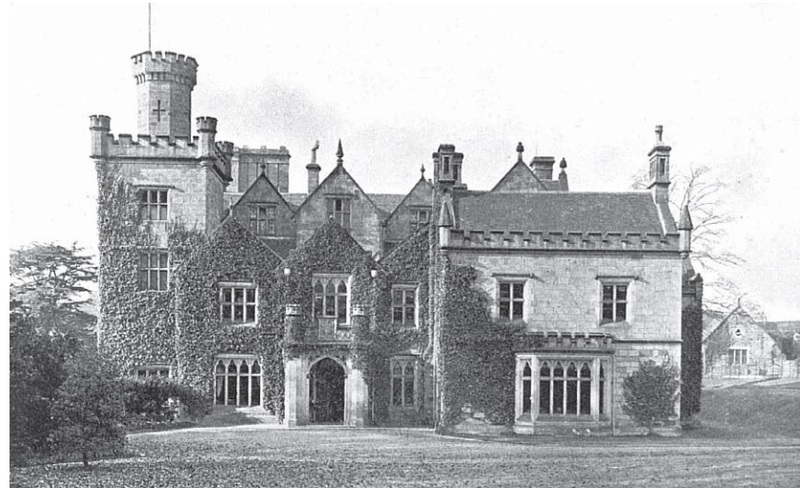 In 1894 Rothwell sold Sharples Hall and we might have expected him to have made long-term plans for Breadsall Priory. However, Rothwell’s interest in the house was waning and may even have overstretched his finances. In November 1896 the Derbyshire Times and Chesterfield Herald reported that Sir Alfred Haslam had ‘practically acquired’ the ownership of Breadsall Priory. 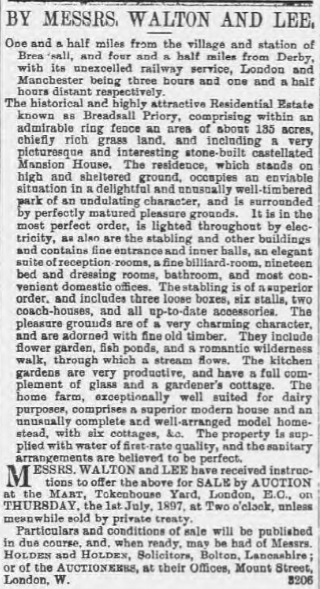 In May 1897 Messrs. Walton and Lee were preparing auction of Breadsall Priory. The house came with 135 acres of rich grass land but the property was eventually withdrawn from the market. In August 1897 the estate was sold by private treaty. The buyer was Sir Alfred Seale Haslam who had been interested in Breadsall Priory for several months. Richard Rainshaw Rothwell moved to Hove, in Sussex, where he was reported to be living on his own personal wealth. He later moved to Devon where he resided at Morebath Manor until his death in 1948. Alfred Seale Haslam was the fourth son of William Haslam, an iron-trader from Derby. Alfred was educated at the Diocesan School and privately. He started work as a practical engineer at the works of the Midland Railway Company in Derby and the establishment of W.C. Armstrong and Co at Newcastle-upon-Tyne. In 1868 he returned to Derby and joined the Union Foundry and Engineering Works at Little Chester. It was in 1880 that Alfred had pioneered an early refrigeration system. The equipment allowed for the transport of meat in sound condition from the colonies of the Antipodes. The following year it was fitted to a steamer which transported 17,000 carcases to Britain from Australia. The idea was ridiculed at first and there was opposition from the British agricultural interest and the prejudice of the British consumer. The company was converted into a limited company in 1876 and was renamed as the Haslam Foundry and Engineering Company Ltd. He became the Managing Director and principal shareholder. A devout Baptist, Alfred married Annie Tatum, the daughter of Mr Thomas Tatum of the Elms, Little Eaton, in 1875. They lived at North Lees, Duffield Road, Derby. Haslam became a Borough magistrate in 1886 and a Derbyshire magistrate in 1891. 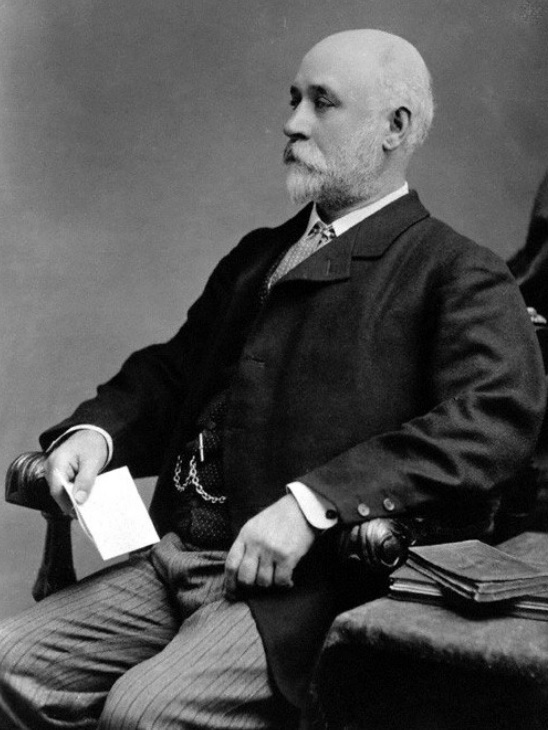 He became Mayor of Derby in 1890 and 1891. In the year of his second term he received Queen Victoria on her visit to the town and was later knighted on the platform of Derby Station. Alfred was chosen as a Unionist candidate for Derby in the general election of 1892 but suffered defeat. He filled many public offices in Derby, including the Presidency of the Derby Chamber of Commerce and the Derby Children’s Hospital. With considerable personal wealth it was only fitting that Alfred Seale Haslam was looking for a home of better standing. However, his move to Breadsall Priory in 1898 led to a parting of ways with Derby Corporation. His new house was outside the borough and disqualified him from council matters. His qualification further failed owing to his company being a limited liability company and therefore carried no vote. The difficulty might have been overcome had Haslam rented a single room at his works or even taken a room elsewhere in the borough. Haslam refused and his council duties came to an abrupt end. Settled in his new home Alfred offered his services to Newcastle-under-Lyme across the border in Staffordshire. He was not a regular member of the council but was Mayor for three successive years from 1902. For a time he combined this role with that of Unionist M.P. for Newcastle, winning his seat by 182 votes in 1900, and sat until 1906 when he was a victim of the great Unionist debacle of that year. Alfred donated a statue of Queen Victoria which still stands at the Blackfriars end of the Thames Embankment in London. Similar statues were also funded for Derby and Newcastle-under-Lyme. Although Sir Alfred Seale Haslam resided in London he spent as much time as possible at Breadsall Priory. He added a large west wing in Elizabethan style obscuring half of Bentley’s west front. “He demolished Morley’s billiard room, replacing it with a library. Beyond that he built his own billiard room complete with minstrels’ gallery and raised seats for the spectators. It was a striking room, decorated like Morley’s in Moorish style, with a moulded plaster ceiling with pendants. The large window on the north side looked out in Haslam’s day into a little courtyard complete with a rockery. “At the west end of the south front Haslam built a gable matching Morley’s replica gable of 1861. Haslam’s coat of arms and the date 1899 are still visible above the library’s bay window. In the room at ground floor level below the billiard room was a small windowless area for use as a photographic dark room. (This was used by Haslam’s eldest son, Alfred Victor Haslam who took many photographs of Breadsall Priory). “The drawing room was accessed from the entrance hall by a separate flight of stairs running parallel to the main staircase. “In the dining room the fine oak panelling covering the lower half of the walls came from Sir Alfred’s Derby home (presumably North Lees). “Outside the dining room Haslam installed a large Gothic door made by his father, William Haslam. 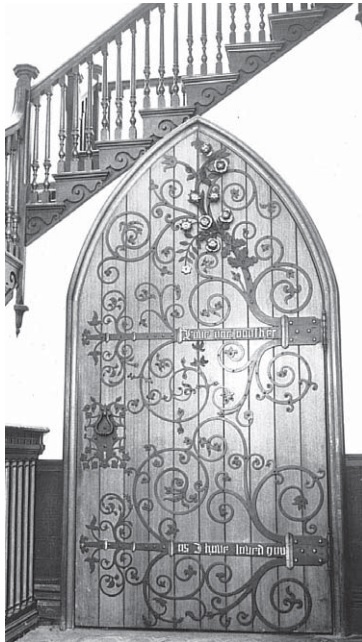 The door had been displayed at the Great Exhibition in 1851 as an example of ancient church wrought iron-work and was hugely praised. 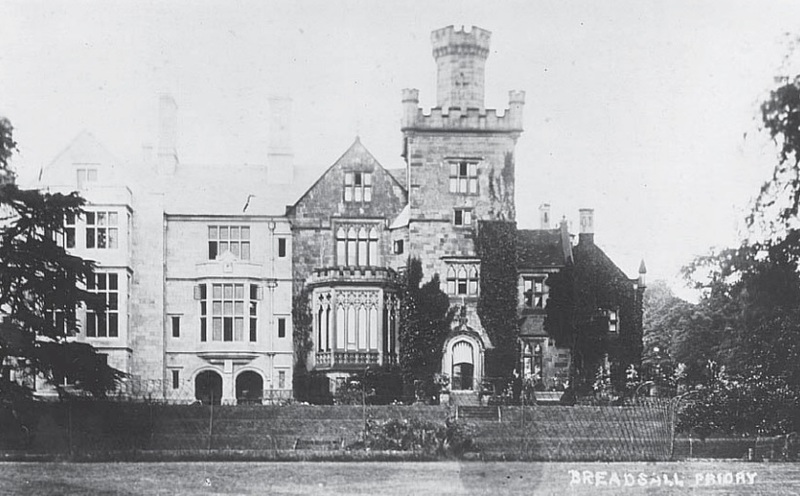 In August 1904, Alfred, keen to show off his new country house, invited the whole of his workpeople at the Haslam Engineering Works to Breadsall Priory, together with their wives. In total there were about 700 people present for the occasion of the homecoming of his son, Alfred Victor Haslam, and his new bride. Haslam later commissioned Thomas Hayton Mawson, the garden designer, to develop the pleasure grounds. A new rose garden was created in 1909 and it is thought that many fragments of stone from the old priory were finally cleared away. 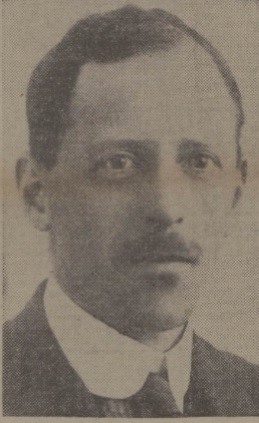 Sir Alfred Haslam attracted much interest at the outbreak of World War One. While Breadsall Priory became Alfred’s ‘pride and joy’ it also experienced tragedy. In 1907 Alfred’s eldest son, Alfred Victor Haslam, died at Northfield, his residence on Duffield Road, Derby. In 1917 Captain Kenneth Seale Haslam, his youngest son, of the North Midland Howitzer Brigade, was killed in action at Guémappe, east of Arras. Of the three sons only Eric Haslam survived as well as his two daughters – Edith Hannah Haslam, who still lived at home, and Hilda Annie Ham, wife of the Rev Herbert Ham, Vicar of Wirksworth and later Provost of Derby Cathedral. 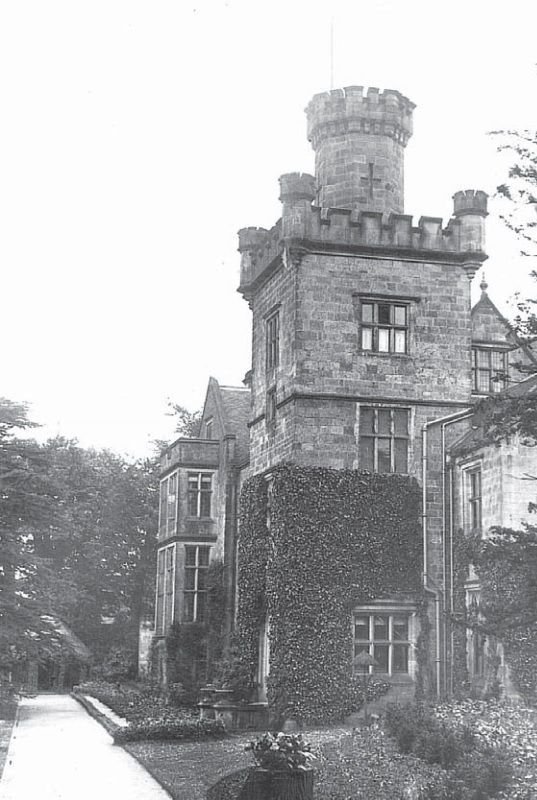 His wife, Lady Haslam, died in March 1924 at Breadsall Priory. Sir Alfred Haslam had been far from well but rallied sufficiently to continue his business affairs. He still visited his factory every day and travelled the country for meetings. It was on such matters that he travelled to London in January 1927. He was staying at the Midland Grand St Pancras Hotel and on the night of January 12 complained of feeling unwell. He retired to his room with orders for a hotel servant to wake him early next morning. After receiving no response to his knock the servant entered the room and found Sir Alfred dead in bed. His estate amounted to £1,064,393 after estate duty of £288,691 had already been paid. Newspapers of the day took great delight in calling him the ‘millionaire businessman’. Both Sir Alfred and Lady Haslam were buried at Morley. 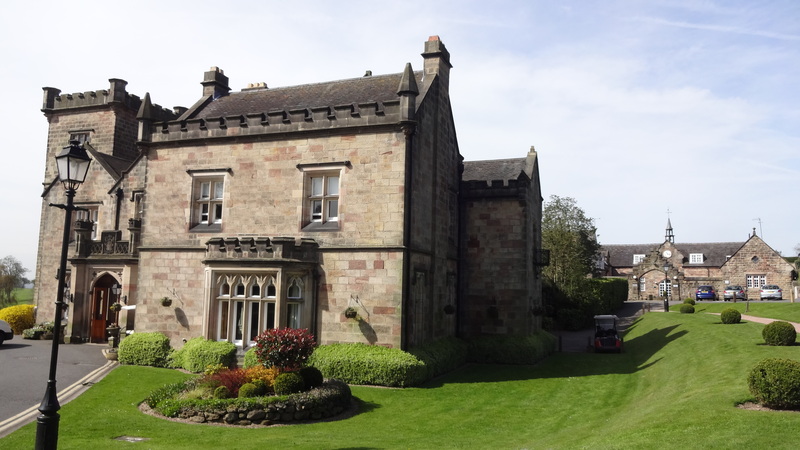 The Breadsall Priory estate was left to Alfred’s second son, Captain Eric Seale Haslam, who was 41-years-old, and his houses on Duffield Road were given to his daughters. Eric Seale Haslam was born in 1886 and educated at Haileybury College in Hertfordshire. He later trained to be an engineer at the Rhos Prepatory School in Colwyn Bay. During the First World War he served with the Territorial Artillery, and was wounded at Loos in 1915. He returned to action but was invalided out of France following a serious railway accident in 1916. Just a year later his younger brother, Kenneth Haslam, was killed in action. Eric Seale Haslam had joined the family business and became chairman, choosing to rename the company as the Derby Pure Ice and Cold Storage Co Ltd*. The story of Eric Seale Haslam at Breadsall Priory might also be the story of his sister, Edith Hannah Haslam. She remained at Breadsall following the death of her father and appeared to live happily alongside her brother. While Eric was the person safeguarding the finances it was Edith who became the public figure. 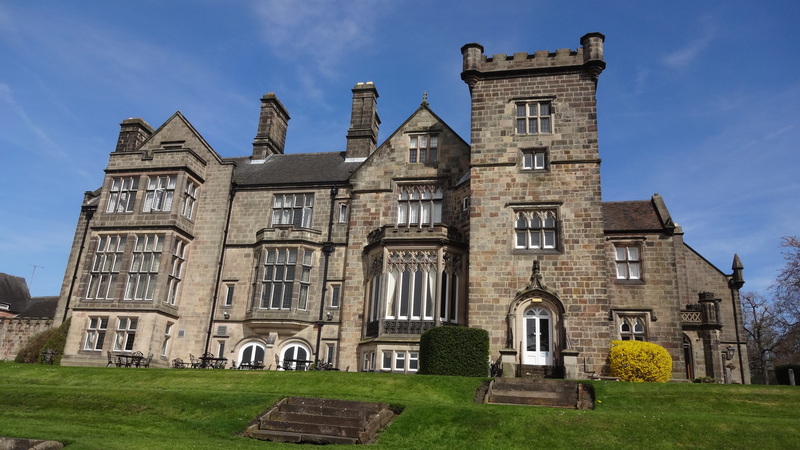 “I went over to Breadsall Priory and , after tea with Miss Edith Haslam, Mr Eric Haslam, her brother, and Sister Ward of the St Christopher’s Home for Wayfaring Women, was taken to look at the terrace, rock garden and stream. 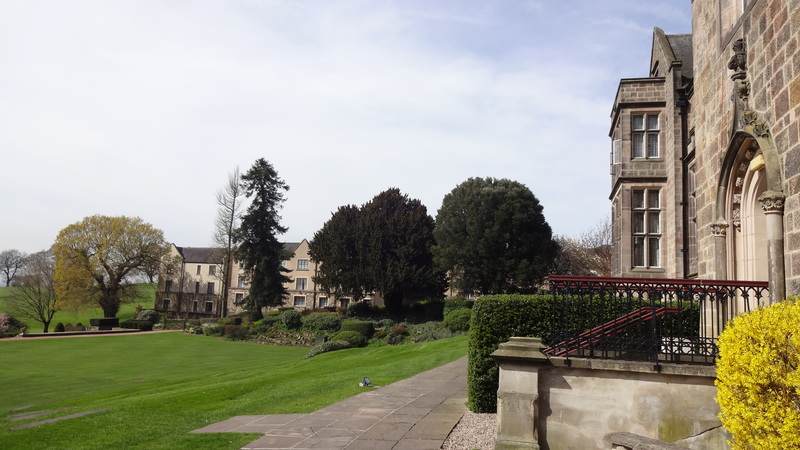 “There are some grounds which never give a caller the pleasure occasioned by the first visit, but those belonging to Breadsall priory have the knack of making a greater appeal every time they are seen. “A flag path had to be treated carefully because of the aubrietas which grew in every crevice. In every shade of purple they were exquisite. Nick Redman states that the tall stair turret and four bartizans on top of the tower were removed at the beginning of the Second World War. This was to avoid Luftwaffe bombers using Breadsall Priory as a landmark as they headed towards the Rolls-Royce factory in Derby where Spitfire engines were made. The drawing room was also used by the Derbyshire Children’s Hospital as a convalescent ward. During this period Eric Haslam served as a Special Constable around Derby. The war also unearthed another one of Breadsall’s secrets. While excavating to build an air raid shelter a 13th century doorway was discovered from the old priory. This was later restored and is visible today. Further excavations also revealed part of a lower floor level with drains that turned out to be the canon’s washing area, fragments of the old priory walls and the remains of the bake-oven. Redman also says that during a fire in one of the outbuildings in 1947, water was used from the ornamental lake to put it out. The following year the lake developed a leak and emptied gradually filling with bushes and small trees until restored in the 1970s. 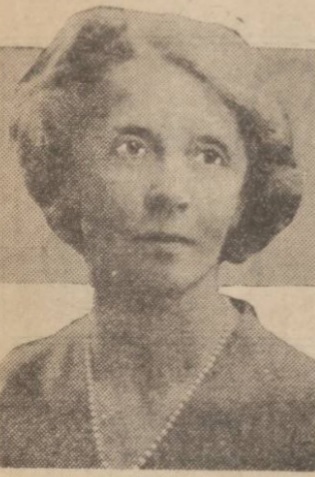 Edith Haslam died in December 1941. She left a will of £52,611 but it was the contents of the will that summed up her generosity. £5,000 was given to her nephew, Christopher Haslam Dillon Ham, with £2,000 each to Eric and her sister Hilda Ham. Edith gave £1,000 each to Gwendoline Peach and May Ward. She left St Christopher’s House to Hilda, £200 was given to St Alkmund’s Garden and £500 each to Derby Hospital for Sick Children, the Victoria Home of Rest and the Mission of Lepers in Covent Garden. Edith also gave £100 each to her maids of three years’ service. Eric Haslam, long retired and calling himself a ‘farmer’, died of cancer in 1967 and was buried at St Matthew’s Church at Morley. His widow, Norah, lived alone before moving to a new house, Priory Chase, built-in one of the quarries near the entrance lodge. She lived here until her death in 1988. There was a sale of surplus contents in May 1970 but the main house was unoccupied. It was a target for thieves and the garden and grounds slowly became overgrown and the drive rutted. For a house that once prided itself in its lovely gardens it was a sad demise. Finally, in late 1970, the Breadsall Estate was put up for sale. It included the house and its grounds that had now been extended to 828 acres. Breadsall Priory was bought by Charles Harpur-Crewe, whose family already owned much of the land around it. 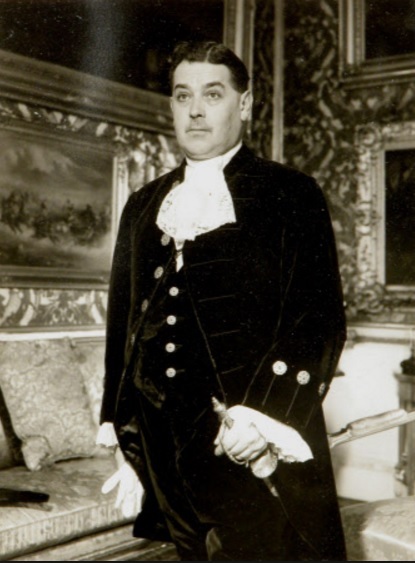 Charles (born Jenney) was the grandson of Sir Vauncey Harpur-Crewe, the last baronet of Calke Abbey in Derbyshire. The Calke Abbey estate had passed down the female line until Charles (now called Harpur-Crewe) inherited it in 1949. The Harpur-Crewe’s estate holdings were very large; apart from Calke abbey and the thousand or so acres of parkland immediately adjoining it, they had some 9,000 acres of land in Staffordshire, Derbyshire and Leicestershire, for the most part let to agricultural tenants, and also about 3,000 acres of moorland in the Staffordshire Peak District. 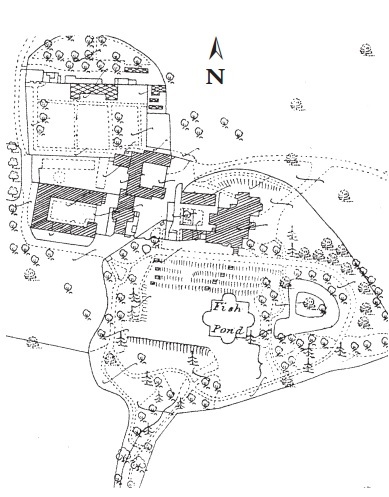 Harpur-Crewe probably wanted Breadsall Priory for its land rather than the house. The purchase came with uncertainty and he wrestled for most of his life with large death duties and had little or no money to spend. It is likely that David Cox’s approach to Charles Harpur-Crewe was a difficult and complicated affair. We know that Harpur-Crewe was a stubborn man and planning and legal delays meant it wasn’t until October 1974 that permission was finally granted. 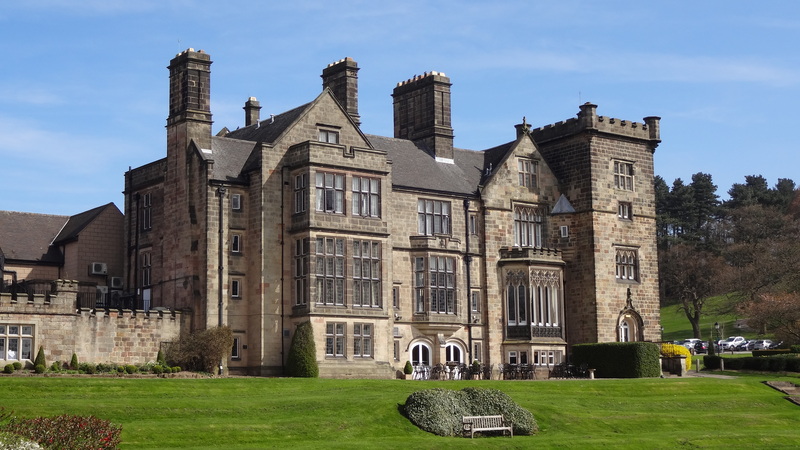 Cox signed a long lease to convert Breadsall Priory into a country house hotel and golf complex. Cox set about refurbishing the sad and empty house. 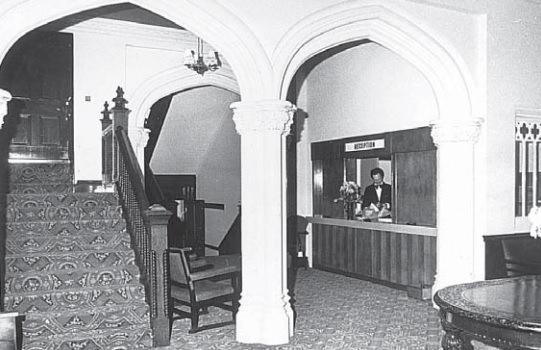 The dining room was turned into the Elizabethan Restaurant and Rothwell’s organ was dismantled to make way for the new hotel reception. The Billiard Room became the Oak Room and the Drawing Room was renamed the Wedgewood Room. 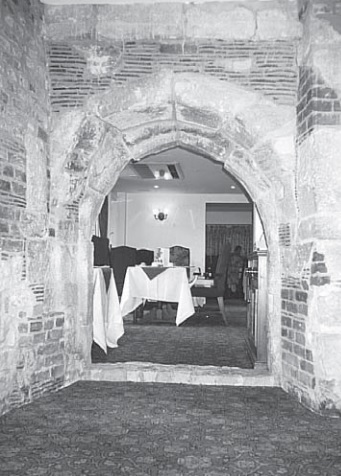 A bar, called the Monk’s Bar, was built over the canon’s old washing area, and the 13th century doorway, discovered by Eric Haslam, was made a feature of the room. Cox created 17 bedrooms upstairs and opened for business in May 1976. Alongside the hotel development, a new golf course was created within the parkland. The course, enhanced with Cumberland turf, was designed by David Cox, John Flanders and Richard Lambert. The Home Farm building was converted into a club house and in 1977 the Breadsall Priory Golf and Country Club was officially opened. 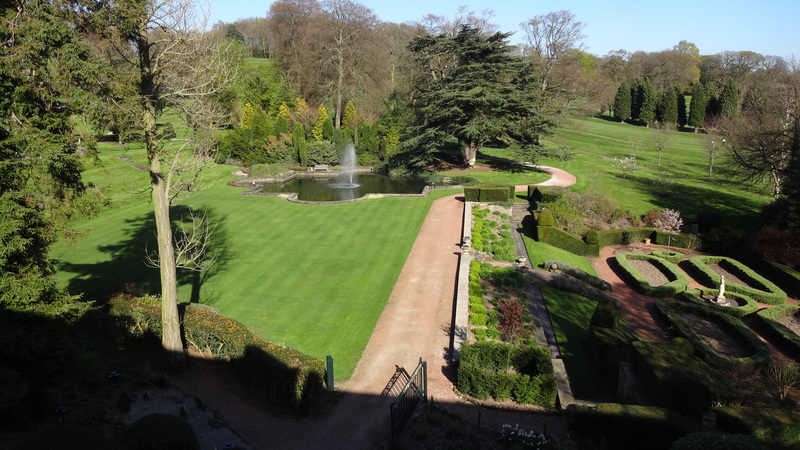 The gardens, once the pride and joy of the Haslam family, were cleared and restored and the ornamental lake put back in working order. 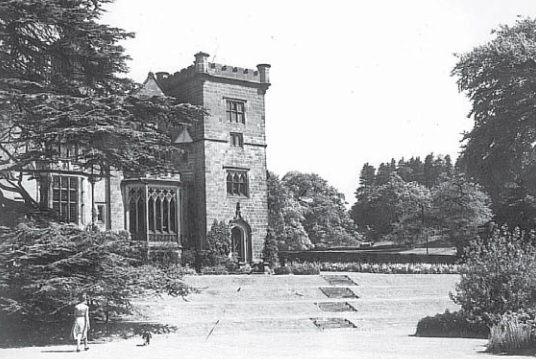 Charles Harpur-Crewe died in 1981 and inheritance tax problems enforced the sale of the Breadsall Priory estate. David Cox was able to buy it outright while Calke Abbey passed to the National Trust in 1985. 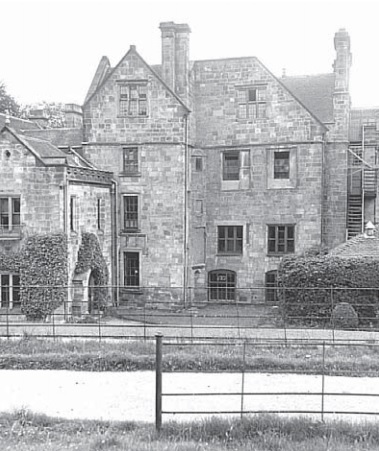 In 1986 David Cox was approached by Country Club Hotels, a subsidiary of Whitbread PLC, about buying Breadsall Priory. Negotiations over the sale lasted two years and a deal wasn’t concluded until January 1988. The purchase by Whitbread marked a significant change for the house. Their first priority was to increase the number of bedrooms to 92 by constructing a new bedroom block. 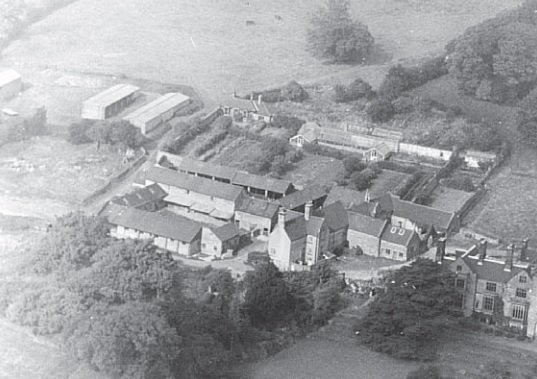 A leisure complex was also added using old farm buildings and a swimming pool was created in place of the old farmyard. More importantly a restoration programme was carried out on the old house and a new kitchen block was built alongside. The golf facilities were also improved with the creation of the Moorland course and a new pavilion which opened in 1992. Breadsall Priory Hotel Golf and Country Club opened in 1990. In 1996 Whitbread obtained the franchise rights for the Marriott name in Great Britain and the hotel was rebranded as the Marriott Breadsall Hotel and Country Club. A new accommodation block, with 24 bedrooms, was built in 1997. As a salute to its former owners a number of rooms were renamed to become the Haslam, Darwin and Morley Rooms. Whitbread sold its portfolio of 46 Marriott hotels to the Royal Bank of Scotland (RBS) in 2006. The deal, reported to be £954m, allowed the Marriott Corporation to operate the hotels on behalf of the new owner. RBS eventually sold the chain to the British Virgin Islands-based Professional Ventures Corporation (PVC) for £1.1bn in 2007. In 2008 Marriott refurbished the historic meeting rooms, leisure complex, restaurant and golf facilities at Breadsall Priory. However, there were still troubled times ahead. In 2011 it was reported that the Marriott hotels chain had been placed in administrative receivership after PVC failed to make loan repayments. RBS, the majority lender on the debt, regained control of the property portfolio and eventually sold the chain, including Breadsall Priory, to the Abu Dhabi Investment Authority (ADIA) for £640m in 2013. 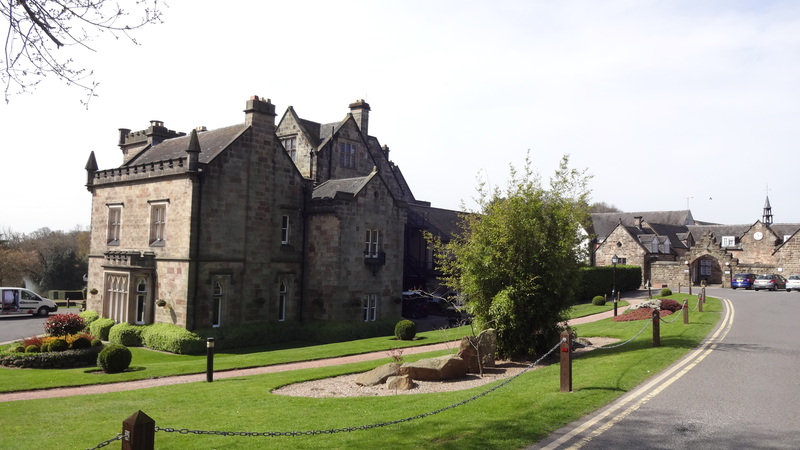 Breadsall Priory is now regarded as the oldest Marriott hotel in the world. The process of writing this post has been made considerably easier due to the chronology of events and extensive research already carried out by Nick Redman . An excellent account of its evolution is included in his book An Illustrated History of Breadsall Priory (2009) which proved invaluable and is quoted often. *Eric Seale Haslam, continued in the family business, renamed the Derby Pure Ice and Cold Storage Company. In 1928, the Haslam Foundry Company was taken over by the electrical engineers Newton Brothers Ltd who changed its name, in 1935, to Newton Brothers Ltd. But the refrigeration side was bought in 1935 by L Sterne & Company Ltd of Glasgow who had been making refrigeration machinery since about 1882. Louis Sterne died in 1953; the company continuing in the refrigeration business until it virtually ceased trading in 1961, being acquired by Prestcold Ltd, owned by British Leyland, in 1968. The Sterne name was phased out in 1971. The name ‘Derby Pure Ice and Cold Storage Company’ was liquidated in 1976.